BUFFALO, N.Y. (AP) — Nashville goaltender Pekka Rinne prefers the excitement of a tightly contested race for the Central Division title during the final week of the season. “Within this locker room, we have goals and things we’re striving for, and it’s about continuing to move in the right direction,” Johansen said. Johansen was in an ideal position at the right time in the third. Viktor Arvidsson’s shot from the right side caromed off the end boards and directly to Johansen, who backhanded the puck into the open side. Smith’s game-opening goal was allowed to stand when replays were inconclusive in showing whether his stick was too high when deflecting in Subban’s shot from the blue line. Then there was a quick whistle that negated a goal for Buffalo’s Conor Sheary in the second period. 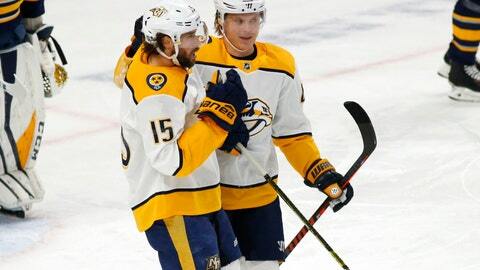 The play was stopped while a delayed penalty was called against Nashville even though no Predators player appeared to have control of the puck. He said the Sabres watched replays that clearly showed the puck hitting Smith’s stick. But he was more frustrated with Sheary’s disallowed goal. Subban defended Dahlin’s performance by noting he has made similar mistakes through his career. NOTES: Predators LW Austin Watson returned for the first time since he was suspended by the NHL more than two months ago for alcohol abuse. Watson missed 27 games with Nashville and had four goals in two games during a conditioning stint with AHL Milwaukee before being recalled Sunday. … Sabres D Marco Scandella will miss the final week with a lower-body injury. … Buffalo has gone 20 consecutive periods without holding a lead, dating to Sam Reinhart scoring the opening goal in a 7-4 loss at Montreal on March 23.